Note: The polls for Round 2 are now closed. 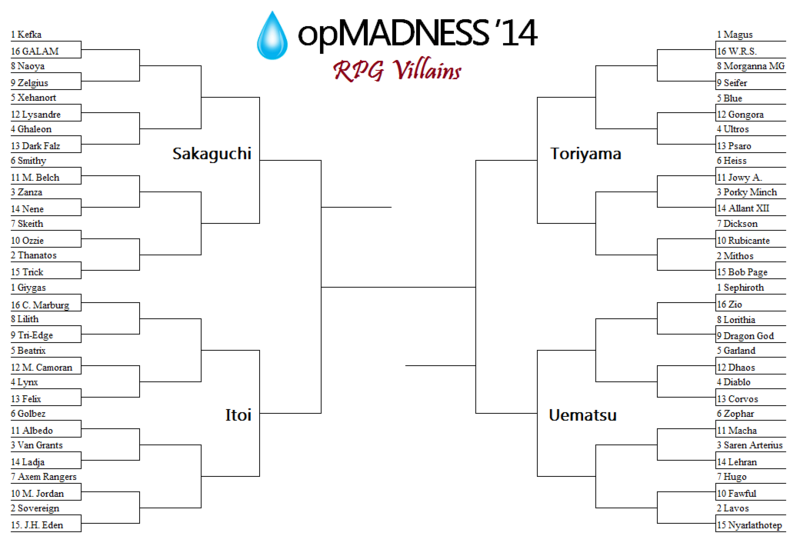 So last Friday, we opened up voting for Operation Madness, our 64-character tournament of RPG Villains. With the close of voting for the first round last night, I can honestly say that…I expected most of these results. However, it did get quite close in some match-ups, with many of you having to make difficult choices early on. And to that I say…HIGH FIVE TO ME FOR BRACKETING THIS THING! Okay, let’s see what you guys thought of Round 1. 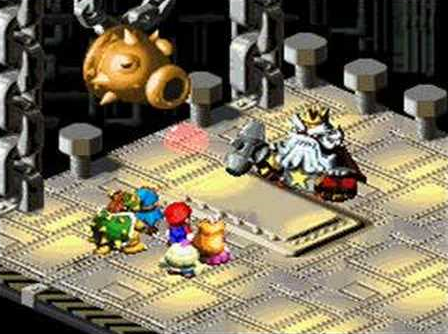 Yes, the villain from Cosmic Fantasy 2 did take part in the tournament. But just like any other 16th-seed in any other tournament like this, it succumbed to the much more powerful force. Kefka basically took the lead with the first vote, then ran and hid for three days. If only the rest of the competition were like that. To be honest, because of how many views our Top 10 Kalos Pokémon article is getting, I almost expected Lysandre to pull the upset in this battle. However, Xehanort’s power was too much for the beauty-obsessed villain. He may not get to Kingdom Hearts, but he moves one step closer to being crowned champion. …Or perhaps a beatdown at the hands of Kefka. Either one. The Lunar: Silver Star Story villain made decent mincemeat out of the dark force from Phantasy Star. Not being one who knows much about the Lunar series, it will be interesting to see how he does in the next round. This was one of many close battles that happened this round. Both Smithy and Belch were in a massive dogfight from the moment the voting started, and it didn’t let up throughout the process. While it could’ve gone either way, Smithy just had enough at the end to make it through this muck-filled fight. It was easily one of the most lopsided battles outside of the four number-1 seeds. The power of Zanza was just too much for Nene. If this is a sign of things to come, things will really get interesting in this grouping. While a 10 beating a 7 isn’t really much of an upset in a basketball tournament, it’s the closest thing we’ll get in this grouping. But I wouldn’t go too far with that talk. Ozzie is a formidable villain and could give fits to competitors down the road. 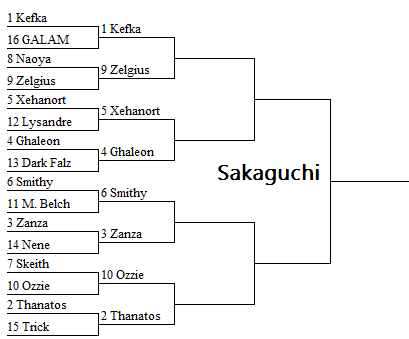 Kefka had an easy go of it in the first round, but that is about to change drastically as he goes up against one of the more popular villains from Fire Emblem, a series that rightfully gets a lot of love around here. Meanwhile, General Zelgius needs to muster all his strength if he’s to withstand the attack of a madman. Ghaleon took care of business in the first round, but he’ll need to summon all his anger and rage if he intends to get past Xehanort. Whoever wins this will have their hands full in the next round. Smithy has jumped out of the dirty frying pan and goes directly into the fire. The leader of the Smithy gang has a tall task ahead of him in the form of Zanza. As for Zanza, this will be his first true test in a stacked bracket. Ozzie was able to make quick work of Skeith but finds himself running into quite a bit of trouble with Thanatos. The sorcerer from Secret of Mana will be looking to carry his momentum into the next round, with a possible mega match-up in the third round. This is one of four Squaresoft match-ups in the second round. Click here for the Toriyama Bracket or use the navigation tool to move around the article.